the drawing shed is a contemporary arts organisation established in 2009 and led by visual artists Sally Labern and Bobby Lloyd from its project base, LockUpNumber11, located on two housing estates in London E17. the drawing shed’s mobile studios – the drawing shed, ClayOven, PrintBike, The Public Typing Pool© and The Public Reading Wall & Soap-Box – act as an artist-led project resource for collaborations and form one of the central platforms for the work which takes place on the estates, across London and further a-field. Bridging in and out of the durational projects on their estates’ base, the drawing shed’s enduring presence in turn makes way for risk-taking which feeds back into the development of critical practice and ideas. the drawing shed uses social media, drawing, writing, installation, sculpture, social media, festival, food, sound, film and live art to engage with particular communities and create new works, share ideas, develop community- based performance and trigger ‘public’ intervention through provocation. These are often born out of engaging with issues of social / contested space and the often poetic encounters with people and places. The lead artists are always looking to the creative friction of ‘the third space’ – as one of the imagination, of the local, the international and the value of difference. The work they develop off the estates for the drawing shed as Labern&Lloyd is organic and content led, delivering a complex and rigorously engaged collision with contemporary issues and ‘poetic justice’. the drawing shed also commissions other artists to work with the organisation, through participatory projects, interventions and provocations, as well as co-curation. 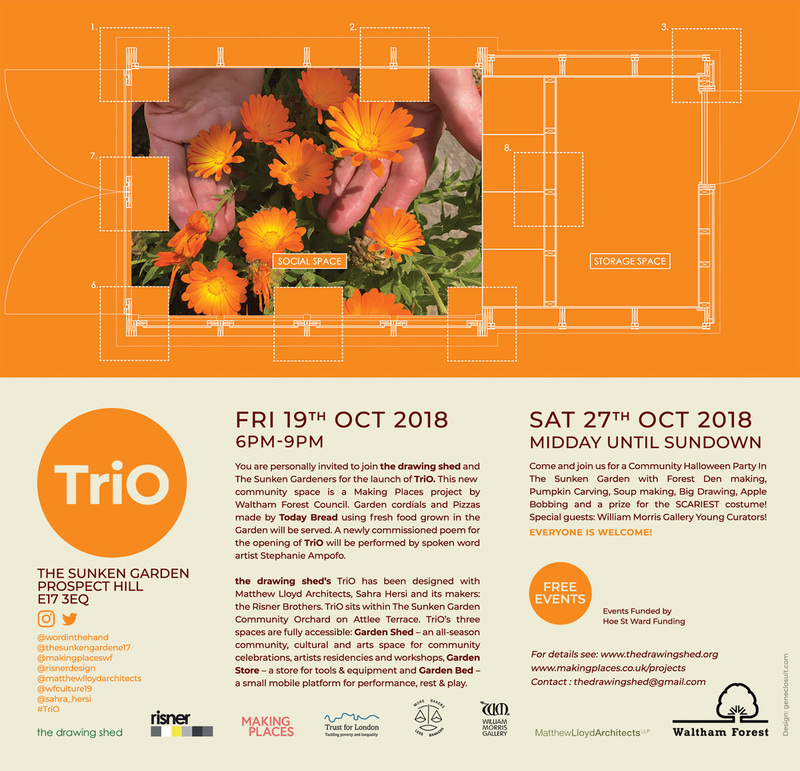 Join the drawing shed and The Sunken Gardeners for the launch of TriO. This new community space is a Making Places project by Waltham Forest Council. Garden cordials and pizzas made by Today Bread using fresh food grown in the Garden will be served. the drawing shed’s TriO has been designed with Matthew Lloyd Architects, Sahra Hersi and its makers the Risner Brothers. Come and join us for a Community Halloween Party in The Sunken Garden with forest den making, pumpkin carving, soup-making, big drawing, apple bobbing and a prize for the SCARIEST costume. Special guests: William Morris Gallery Young Curators! the drawing shed has received project led G4A funding from Arts Council England since its inception, most recently for In/Visible Fields 2018, in addition to being supported by a diverse range of local, regional and national funders and partners. Labern&Lloyd are Fellows of, and work closely with, the Institute for Health and Human Development (IHHD) at University of East London (UEL) on questioning the relationship between creativity, networks, the ‘commons’, community cohesion and correspondent value to well-being. In 2015, the drawing shed received a research and development ACE Grant for the Arts specifically for organisational capacity building and fundraising for co-production. The move from voluntary to charitable organisation in 2015 is allowing the drawing shed to develop an integrated portfolio of practice, build its capacity, extend and deepen relationships with both its academic and contemporary arts partners, including other artists, and create a sustainable future. For this in 2016 they increased the reach of the drawing shed’s community development, to develop the use of LockUpNumber11 and further support the ethics of co-production on the estates. This was made manifest through a series of creative projects including: Live on the Drive (LOT-D) girls’ performance project with artist Katy Baird with the young women becoming the blogging team for live art festival SteakHouse2018; Top Boy Bakers mentoring and baking project with local men and boys with Today Bread, Dusty Knuckle and E5 Bakeries, and The Sunken Garden Orchard, a two year community growing, anti air pollution and arts and science project funded by Trust for London. the drawing shed continues to develop its co-production relationship with the national literature agency Arvon by extending the live-art writing project in London E17. From 2014 – 2017 It co-hosted a live-art writing workshop with Parasol Unit Foundation, the North London based contemporary art gallery and project space, involving members of its own art writing group Stranger : Neighbour. In 2018 the drawing shed was awarded a commission by Making Places for the TriO proposal to be built in partnership with Matthew Lloyd Architects ( with Sahra Hersi and Alex Spicer ) on Attlee Terrace estate.